1/8/14 Negaunee MI – With the temperatures finally warming up, it was basketball time. Mike Plourde and Bob Nadeau were in Negaunee to bring you all the action on 98.3 WRUP as The Ishpeming Hematite Boys took on the Negaunee Miners in an intense rival game. The game started off with each team burning with intent to win. Ishpeming won the jump ball and brought it to the basket quickly. Both teams were playing with fast pace and determination. Shots were blocked and rebounded by both. The ball was going up and down the court evenly matched. Ishpeming then put the first points on the board by scoring off of a steal (2-0 Ishpeming). Both teams continued in a tough battle back and forth. Ishpeming was able to score another bucket as well as Negaunee. Shots were continued to be attempted and points were scored (4-4 Tied). 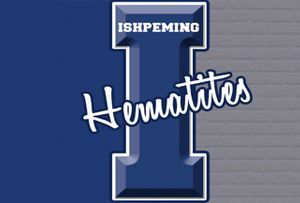 Ishpeming was able to score a long two pointer raising the score to 6-4, (Ishpeming). The Hematites then got a chance at two free throws, the first shot was good and the second shot was made as well bringing the score to 8-4, Hematite lead. The Miners quickly came back with a great bucket (8-6, Ishpeming). The quarter continued with great blocking, shots and rebounds. Negaunee soon tied the score at 8-8 with a lay-up, but the tie was quickly broken with a lay-up by Ishpeming in return and being fouled. With Ishpeming to the free throw line, they scored their free shot making the score 11-8, Hematite lead. Negaunee retaliated with a quick bucket (11-10, Hematites). The first quarter continued to be quick as the clock seemed to speed through the quarter. The quarter ended with a score of 13-11, Negaunee in the lead after a Miner three pointer. The second quarter started with the Hemtites having the ball, and Negaunee utilizing a zone defense. The Hematites fired off a three pointer taking the lead with a score of 14-13. Negaunee switched back to the man-to-man defense after that Hematite three pointer. Negaunee regained the lead at 15-14 quickly with another bucket. Both teams challenging the other with equal talent and skill. Ishpeming took back the lead with another two pointer after a nice play. Both teams continued to push the ball up and down the court, taking turns scoring baskets and taking over the lead. 17-16 Miners then 18-17 Hematites and then 19-18 Miners. The Miners got a chance at the free throw line and were able to score a free throw, making the score 20-18 with the Miners in the lead. Ishpeming was able to tie the score and then return to the free throw line for a shot, but was missed. With the score tied at 20-20, the Miners got a chance at a free throw, and was able to make it in, breaking the tie making the score 21-20, Miners. With three minutes left, Ishpeming made an excellent shot and took back the lead. However, Negaunee retaliated and scored, but Ishpeming posted a three point bucket making the score 25-23 after all the intense back and forth action. Ishpeming then again scored another three pointer but it was quickly answered by a Miner bucket (28-25, Ishpeming). With a minute left the Hematites scored another shot. However, the ball hit the floor and there was a player pile up causing a brief pause in the last minute of the half giving each team a technical, foul bench call. No one got disqualified. The half ended with a score of 30-25, Hematites lead. The third quarter started with a quick Ishpeming bucket and fast Negaunee basket (32-27 Hematites). Both teams were utilizing man-to-man defensive tactics. The Hematites stole a quick Miner pass and got fouled in the process. Then, Ishpeming quickly scored two more baskets increasing their lead to 36-27. The Miners were fouled with Ishpeming confessing to it. The excitement continued as the Hemtites scored another three pointer (39-27, Hematites). The ball looked like it was in a pin ball machine bouncing between players and both teams. More baskets were made by both. The Miners were able to score another basket but the Hematites returned with another three point bucket (45-31, Hemtites). The third quarter excitement continued as both teams battled back and forth. Miners made a nice hook shot making the score 45-33 with the Hematites still leading. The score was up to 47-33 after another Ishpeming bucket, but the Miners returned with a three pointer of their own. Ishpeming quickly retaliated back with their own three point basket, the score 50-36, Hematites maintaining the lead. Ishpeming then returned to the free throw line and was able to make their shot. The quarter ended with a score of 50-39, with Ishpeming in the lead. The fourth quarter started off with both teams continuing with the same fast pace they had in the first quarter. The coaches were telling their teams to slow down, take their time, and set their shots. With both teams firing off passes and shots and scoring them the score quickly became 52-43 after Ishpeming was at the free throw line and able to score both points. A three pointer was posted by the Miners, decreasing the Hematite lead to 53-46. A screen play was also thrown up by the Miners and the Hematites returned to the free throw line, but was unable to score the free throw. With under three minutes left of the game, Negaunee and Ishpeming continued to challenge each other. The Hematites returned to the free throw line again, but were unable to make the throws. The Miners made a reverse lay up after the rebound (53-48, Hematites). Negaunee then scored a nice three point bucket after a time out, closing the Hematite lead to 53-51. The Miners took over the lead after a nice shot. With one minute left of the the game, the suspense was crushing. The Hematites got to take a 1:1 free throw attempt, making both shots, taking over the lead again by one point (54-53, Hematites). Then Ishpeming got their chance at a second 1:1 free throw attempt but weas unable to score. Another time out was called stopping the pace of the game with just over 40 seconds left of the play. A three pointer was posted and made by the Miners making the score 57-55, Miners. No further baskets were made and the game ended with the Negaunee Miners winning with a final score of 57-55.